For the bandy club Yenisey, see Yenisey Krasnoyarsk Bandy Club. The river flows through Tuva, Khakassia and the city of Krasnoyarsk. 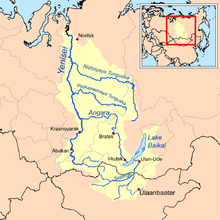 Its tributaries include the Angara, Nizhnyaya Tunguska, Podkamennaya Tunguska and Tuba rivers. The 320-kilometre (200 mi), partly navigable Upper Angara River feeds into the northern end of Lake Baikal from the Buryat Republic but the largest inflow is from the Selenga which forms a delta on the southeastern side. The Yenisei River basin (excluding Lake Baikal and lakes of the Khantayka River headwaters) is home to 55 native fish species, including two endemics: Gobio sibiricus (a gobionine cyprinid) and Thymallus nigrescens [es] (a grayling). The grayling is restricted to Khövsgöl Nuur and its tributaries. Most fish found in the Yenisei River basin are relatively widespread Euro-Siberian or Siberian species, such as northern pike (Esox lucius), common roach (Rutilus rutilus), common dace (Leuciscus leuciscus), Siberian sculpin (Cottus poecilopus), European perch (Perca fluviatilis) and Prussian carp (Carassius gibelio). The basin is also home to many salmonids (trout, whitefish, charr, graylings, taimen and relatives) and the Siberian sturgeon (Acipenser baerii). The Yenisei River valley is habitat for numerous flora and fauna, with Siberian pine and Siberian larch being notable tree species. In prehistoric times Scots pine, Pinus sylvestris, was abundant in the Yenisei River valley circa 6000 BC. There are also numerous bird species present in the watershed, including, for example, the hooded crow, Corvus cornix. River steamers first came to the Yenesei River in 1864 and were brought in from Holland and England across the icy Kara Sea. One was the SS Nikolai. The SS Thames attempted to explore the river, overwintered in 1876, but was damaged in the ice and eventually wrecked in the river. Success came with the steamers Frazer, Express in 1878, and the next year, Moscow hauling supplies in and wheat out. The Dalman reached Yeneisisk in 1881. Imperial Russia placed river steamers on the massive river in an attempt to free up communication with land-locked Siberia. One boat was the SS St. Nicholas which took the future Tsar Nicholas II on his voyage to Siberia, and later conveyed Vladimir Lenin to prison. Engineers attempted to place river steamers on regular service on the river during the building of the Trans-Siberian Railway. The boats were needed to bring in the rails, engines and supplies. Captain Joseph Wiggins sailed the Orestes with rail and parted out river steamers in 1893. However, the sea and river route proved very difficult with several ships lost at sea and on the river. Both the Ob and Yenisei mouths feed into very long inlets, several hundred miles in length, which are shallow, ice bound and prone to high winds and thus treacherous for navigation. After the completion of the railway, river traffic reduced only to local service as the Arctic route and long river proved much too indirect a route. The first recreation team to navigate the Yenisei's entire length, including its violent upper tributary in Mongolia, was an Australian-Canadian effort completed in September 2001. Ben Kozel, Tim Cope, Colin Angus and Remy Quinter were on this team. Both Kozel and Angus wrote books detailing this expedition, and a documentary was produced for National Geographic Television. 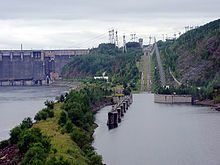 A canal inclined plane was built on the river in 1985 at the Krasnoyarsk Dam. Nomadic tribes such as the Ket people and the Yugh people have lived along the banks of the Yenisei river since ancient times, and this region is the location of the Yeniseian language family. The Ket, numbering about 1000, are the only survivors today of those who originally lived throughout central southern Siberia near the river banks. Their extinct relatives included the Kotts, Assans, Arins, Baikots, and Pumpokols who lived further upriver to the south. The modern Ket lived in the eastern middle areas of the river before being assimilated politically into Russia during the 17th through 19th centuries. Some of the earliest known evidence of Turkic origins was found in the Yenisei Valley in the form of stelae, stone monoliths and memorial tablets dating from between the 7th and 9th centuries AD, along with some documents that were found in China's Xinjiang region. The written evidence gathered from these sources tells of battles fought between the Turks and the Chinese and other legends. There are also examples of Uyghur poetry, though most have survived only in Chinese translation. Wheat from the Yenisei was sold by Muslims and Uighurs during inadequate harvests to Bukhara and Soghd during the Tahirid era. Russians first reached the upper Yenisei in 1605, travelling from the Ob River, up the Ket River, portaging and then down the Yenisei as far as the Sym River. During World War II, Nazi Germany and the Japanese Empire agreed to divide Asia along a line that followed the Yenisei River to the border of China, and then along the border of China and the Soviet Union. Studies have shown that the Yenisei suffers from contamination caused by radioactive discharges from a factory that produced bomb-grade plutonium in the secret city of Krasnoyarsk-26, now known as Zheleznogorsk. The bridge over the Yenisei in Krasnoyarsk, Russia, viewed from the left bank. The Yenisei (left) and the Ob flow into Kara Sea. ^ "Station: Igarka". Yenisei Basin. UNH / GRDC. Retrieved 31 March 2013. ^ "Yenisei River". Hammond Quick & Easy Notebook Reference Atlas & Webster Dictionary. Hammond. p. 31. ISBN 0843709227. ^ "Yenisei River: Siberia's blessing and curse". RT. 11 June 2010. Retrieved 8 June 2014. ^ Alan Taylor (23 August 2013). "A Year on the Yenisei River". The Atlantic. Retrieved 8 June 2014. ^ C Michael Hogan (13 May 2012). "Yenisei River". Encyclopedia of Earth. Retrieved 23 April 2015. ^ "Yenisei River". Geology Page. 4 February 2014. Retrieved 6 January 2019. ^ a b c Freshwater Ecoregions of the World (2008). Yenisei. Retrieved 16 July 2014. ^ Russell, D.E. ; Gunn, A. (20 November 2013). "Migratory Tundra Rangifer". NOAA Arctic Research Program. ^ Kolpashikov, L.; Makhailov, V.; Russell, D. (2014). "The role of harvest, predators and socio-political environment in the dynamics of the Taimyr wild reindeer herd with some lessons for North America". Ecology and Society. ^ Permanent International Association of Navigation Congresses. (1989). Ship lifts: report of a Study Commission within the framework of Permanent . PIANC. ISBN 978-2-87223-006-8. Retrieved 14 December 2011. ^ Vajda, Edward G. "The Ket and Other Yeniseian Peoples". Retrieved 27 October 2006. ^ Halman, Talah. A Millenium of Turkish Literature. p. 6. ^ Ian Blanchard (2001). Mining, Metallurgy and Minting in the Middle Ages: Asiatic supremacy, 425-1125. Franz Steiner Verlag. pp. 271–272. ISBN 978-3-515-07958-7. ^ Fisher, Raymond Henry (1943). The Russian Fur Trade, 1550-1700. University of California Press. ^ David Hoffman (17 August 1998). "Wastes of War: Radioactivity Threatens a Mighty River". The Washington Post. Retrieved 13 February 2015. Wikimedia Commons has media related to Yenisei River. Wikisource has the text of the 1911 Encyclopædia Britannica article Yenisei. William Barr, 'German paddle-steamers on the Yenisey 1878-84', The Journal of the Hakluyt Society, August 2014.